Share the post "Podcast Episode 37: Freelance Writers and Social Proof – What it is, why you need it and how to get it"
Wiki[pedia describes social proof as, “a psychological phenomenon where people assume the actions of others in an attempt to reflect correct behavior for a given situation”. Basically, we are tempted to replicate whatever we see people around us doing. Social proof can play an important role in marketing and self-promotion for a freelance writer, and in this solo episode, Lorrie looks in more detail at what it is, why it’s important, and how you can harness it to win, and keep, more work. And finally, please ‘like’ us on Facebook to be the first to hear our news and to talk with us about what you hear on the podcast! LH: Hello and welcome to Episode 37 of A Little Bird Told Me: the podcast about the highs, the lows, and the no-nos of successful freelance writing. You can find us on the web at alittlebirdtoldme.podomatic.com and there you can subscribe to the podcast via RSS feed, iTunes, Stitcher Smart Radio or just there on the Podomatic page itself. It’s worth clicking the subscribe button, it really is because you’ll get a notification as soon as our new episodes are out. On the Podomatic page itself you’ll also find the links to our Facebook page where you can come and chat to me and Pip and ask us any questions you might have and give feedback on the episodes you’ve listened to so far, and you’ll also find links to our websites and our social media feeds, as well as to other episodes, transcripts and show notes, many of which are actually handy links to resources for freelancers. I’m Lorrie Hartshorn and this week, I’m here without my usual co-host Pip. She’ll be back next week as usual, though, so put your hankies away and keep listening for what I hope will be another really helpful solo episode. This episode is all about social proof – what it is, why it’s important when you’re marketing your business and the services you offer, and how you can get more of it. doing something, they’ll do it too. Laughing at risqué jokes, jumping to the front of the queue, dropping litter, screaming at boybands and claiming you totally love that new single even though you’ve never heard of the person who sings it. All these things are evidence of the power of social proof. In terms of marketing for your business, social proof can consist of testimonials, letters of recommendation, LinkedIn endorsements, quoting percentage success rates, positive case studies, Facebook ‘likes’, Twitter followers and so much more. Expert Social Proof: Approval from a credible expert, such as an industry blogger or other authority. Celebrity Social Proof – not something I think will apply to many of us! Approval or endorsements from celebrities, especially those that are unpaid. User Social Proof: Approval from current users of the product/service, such as customer testimonials, case studies, and those all-powerful reviews. ‘Wisdom of Your Friends’ Social Proof: Approval from your friends or people you know – traditional word-of-mouth. Social proof is everywhere. It’s why we have a Top 40 chart. It’s why we have bestseller lists. It’s why Oprah’s book club in the States, and Richard and Judy’s book club here in the UK, and all manner of celebrity endorsements do so well. It’s the reason actors are “Oscar nominated” and the reason sit-coms have canned laughter tracks. If everyone else is laughing, you should too – it’s proof that it’s funny! Why is social proof important? So why is social proof so important? Surely if you’re selling a decent product or service, clients can make their own minds up. Well, yes, and no. Social proof helps your hard work go further. It means that the positive ripples from one good deed, or brilliant project or whatever, reach beyond your client. Social proof is a powerful way of telling prospective customers and clients that you are a trusted service provider who’s done a good job for others; which means that they can be reassured that you’re more likely to do a good job for them. The path has already been trodden, and it’s safer for new customers to follow. Now, with social media’s continuing ascent, social proof is now more visible and easier to leverage than ever. Why else would so many businesses spend so much time trying to gain public approval across these marketing channels? Social proof can help you win new and repeat business, increase sales by a phenomenal amount, build up your reputation as an expert (for more information on how to do that, btw, have a listen to Pip’s solo episode on the subject – I’ll link to it in the show-notes) and generally enjoy a better level of trust with your target market – if you have the right social proof. According to Google , 70% of US consumers state that they examine product reviews before making a purchase. And which of us can’t say the same? I check TripAdvisor before booking any hotels, for example, to see what others are saying. I don’t know the reviewers. They could be compulsive liars for all I know, but it doesn’t matter – I feel more comfortable booking a hotel that 80% of people have recommended than one which only has 40% positive reviews. What’s more, a study by CompUSA and iPerceptions showed that 63% of consumers say they are more likely to purchase from a site if it has product ratings and reviews. A good reason, if you needed one more, to display and share testimonials on your business website and social media profiles. Where Do You Get Social Proof? The nice thing about social proof is that, most of the time, it’s really easy to get. You can simply ask for it, a lot of the time, or just straight out get it! It makes me question why people don’t shout about their positive reviews. You can ask existing clients to recommend you – either with a testimonial, a thumbs-up on your social media platform of choice, a LinkedIn endorsement or simply by word-of-mouth. You can post recommendations on your website, tell people what percentage of your clients were happy with the work you did for them, write case studies about the improvements your work made to someone else’s business…although make sure your client doesn’t want to remain anonymous because otherwise negative social proof will be coming your way! As I mentioned earlier, social media mentions – particularly by people with a lot of influence – celebrities, experts etc. –will help to establish you as someone worth talking to and following. People will feel reassured if they see someone they know following you. You can also piggy-back of someone else’s social proof. Post brilliant content on your social media feeds and wait for the RTs to come flooding in. If lots of people are following you and effectively endorsing your social media activity, you can expect others to see this and do the same. Guest-blogging is another way to piggy-back social proof (and again, we’ve done an episode on how to make guest-blogging work for you, so check the show-notes for the link). If you can wow the owner of a popular, high traffic website with a proposal for a guest post, you’ve got yourself a brilliant social proof opportunity. Your appearance on that blog will be tantamount to an endorsement and will help to raise your profile. Authors gain social proof by sending copies of their books to people in the hope that positive reviews will be forth-coming. Likewise, bloggers send links to publications they think might be interested in their work – retweets, comments, discussion: all of these things help lift the writer into a position of trust and importance. Social proof is hugely valuable and it can be frustrating when you don’t have any, particularly when you’re starting out. It’s quite like the whole getting experience without experience business – it can be a bit of an uphill struggle at first. But don’t lose heart. With the advent of sites like Fiverr.com, you can actually buy social proof. For $5, you can get one, three, five, ten thousand followers for your Twitter feed, Facebook page, blog, whatever – but really, don’t do it: being greedy rarely does you any good. If I’m followed by someone on Twitter with tens of thousands of followers, I simply report and block. That person clearly isn’t on social media to be sociable – how can you socialise with 10,000 people? I know that person is just following me to get me to follow them back and I object to it. It’s also pretty obvious when someone has bought followers online. While hard-sell companies can get away with it sometimes, why would a B2B freelance copywriter, for example, have 50,000 followers? If you’ve only just started out on social media, too, and you’re there waving hello to 10,000 new followers despite having tweeted only three times, people are going to smell a rat. And just as positive social proof is hugely valuable, a ruined reputation or the whiff of misbehaviour will do you no good in business at all. My second warning is this: there’s no clearer indication that you’re a social media amateur than begging for follows and retweets (see my solo episode – quite early on – about the sad smell of desperation for more on this!). The whole idea behind social proof is that you demonstrate your value to your audience, and they recommend you organically. – Incentivising purchases or reviews by offering discounts, prize-draws, etc. So now that we’ve talked about social proof, what it is, why it’s important and how you can get it, I hope that you’ll feel more able to go out there and leverage this valuable marketing tool for your brand. Get into the habit of collecting social proof. Ask your clients if they mind you quoting them – even anonymously – when they give good feedback. If they don’t offer feedback but were happy with the work you gave them, ask if they’d mind proving a short testimonial. The worst they’ll say is no. Another thing to remember is to deal efficiently and effectively with complaints, so you have the chance to turn negative experiences into positive ones – customers want to feel like they’re being listened to and taken seriously. Good customer service gets people talking just as much, so make sure you’re exemplary. If you want to offer discounts in return for reviews of your work and testimonials, let customers and prospective customers know. Pop a note on your website; promote it across social media, you can even stick it in your email signature. Rewrite your marketing material and website content to show readers just how good a job you do. Get those stats working for you. Never had an unhappy customer? Tell people! Been told you were instrumental in turning a client’s fortune around? Shout about it! After all, there’s no point having social proof if you keep it secret! So, now it’s time for the A Little Bird Told Me Recommendation of the week. And this week, my recommendation is a lovely little online tool called ThingLink. Thinglink gives you the chance to offer added value from the images you use online. Images are a great way to pep up blog articles and news stories on your site. ThingLink allows you to tag images with other links to other kinds of media – music videos, other articles, subscription links, event invites, ecommerce links, social media platforms and more. You can upload your own images and use those or, by adding the ThingLink plugin to Google Chrome, you can tag any image you find online (I will say at this point that you should only ever use images you have permission to work with – don’t go stealing someone else’s work). The anatomy of an article is really important, and I think ThingLink is brilliant for adding even more rich content value to the content you post online. Images you tag can be embedded not only on sites and blogs, but on social media feeds, meaning that your interactive image will get around and – hopefully – get shared. Social proof again. So there we are. I really hope you’ve enjoyed listening to this episode of the ALBTM freelance writing podcast. If you have any feedback, why not come and chat to me and Pip on Facebook or Twitter? To make sure you don’t miss next week’s episode, head over to alittlebirdtoldme.podomatic.com and hit that subscribe button. Until next week, I’ve been Lorrie Hartshorn – thanks so much for listening. Episode 2: Setting up as a freelance writer: website, social media and brand management best practice. Part 1. Episode 3 of the A Little Bird Told Me podcast: Setting up as a freelance writer: Website, social media and brand management best practice. Part 2. 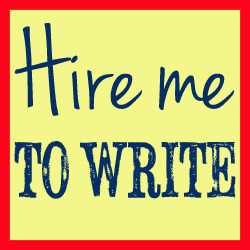 British freelance writer and proofreader.